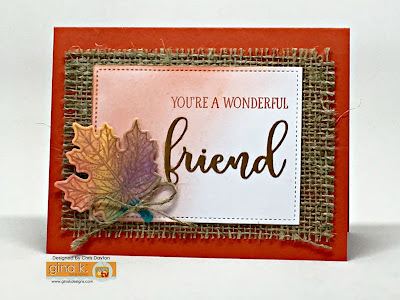 The Cast and Crew for Gina K Designs welcomes you to another fabulous blog hop celebrating the new Gina K Designs Stitched Leaves mini kit which will be back in stock TODAY! We hope to inspire you with some beautiful card projects as you hop along to each of the designer’s blogs! These stamps are so fun, versatile and you can make a variety of different cards and projects with or without the dies! You will be creating with this stamp set and dies all fall long! Have fun and be creative! I used the Metallic Copper cardstock for my word die, and added a bit of Tomato Soup sponging and a piece of burlap for texture on this one. This was stamped with the Distress Oxide ink on my Charcoal Brown cardbase. Look how rich and shiny it appears on Gina's dark cardstock! I used a strip of the inked paper to decorated this simple card. I love this clean and simple card created by mixing the circle frame and sentiment from Give Thanks. 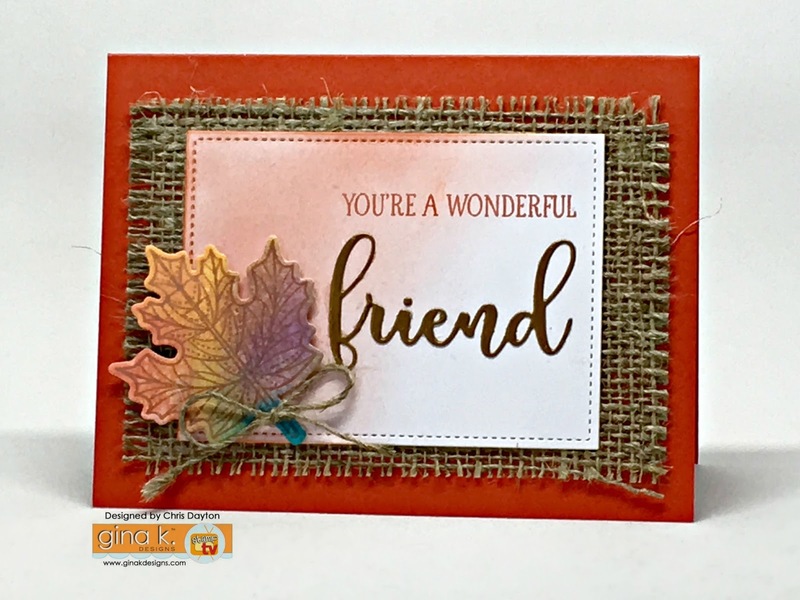 The Give Thanks set was included in last fall's Painted Autumn StampTV kit. Look how fabulously it works with the new Stitched Leaves mini kit. That leaf fits within that circle so perfectly I'd swear Gina planned it! The rest of my Stitched Leaves maple leaf cards are shown in the video above. Ooo love this using the burlap! So very awesome! The black background really got my attention!! Just love the use of it Chris! Beautifully done; love the colors and technique. wOw - Thanks for posting the video. New to making cards and I learn so much from videos... your cards ROCK! What wonderful cards. I love how you've colored the leaves. I love the burlap background (now if I could just find my roll of burlap ribbon). Thanks for providing the great video and wonderful inspiration. These are wonderful cards! I loved the video and learned something new. I like how you kept one piece to lay your leaf into for the stamping. Thanks for the inspiration. Gorgeous cards; the maple leaf, especially, makes my Canadian heart smile! Wonderful cards. Thanks for the video. I love how you created the color for the leaves. Your burlap one is stunning! All are so pretty. WOW! Love all the cards and the video also! Thanks for sharing! Just love how you coloured those leaves and will be CASEing you at some point. Gorgeous. Beautiful, another way to use copper; the contrast with the burlap is wonderful. Thanks for the video showing your technique for coloring the leaves! Very pretty cards! Thanks for the inspiration. I love how you created your leaves! I am in love with the maple leaf in this set too! Your leaves are such pretty colors. You really captured the colors of Fall. This are all just lovely Chris, I especially love the one with burlap! A great video and cards. You do a great job using texture -- love that burlap! Thanks for sharing! Always love a video to go with the card! Thanks. Beautiful cards, Chris! Love how you created the blended oxide leaves! Thanks for showing us how you created the leaves...just Lovely! Great cards, too! Beautiful cards! Fall leaves have got to be one of my favorite things to color! Love how elegant they look on your cards! Lovely fall cards, loving these stitched leaves! OMG this is absolutely the BEST autumn set I've seen this year!!!!! I really like the first card what a different way to show the beauty in making cards. Your cards are beautiful!! Love what you did with watercoloring and the Distress Oxide inks. Thanks for the video. I really like your cards and the colors on the leaves. I just love your use of the multicolored leaves! Thanks so much for great inspiration! Wow what stunning cards! Thanks for sharing! Great texture on the first card. My favorite! Great leaves! Can't have fall cards without them! Your leaves are stunning......thanks for the video and the inspiration 😍!! love these cards and love what you did for the die cuts! Your cards are great and each so different....love the leaves. 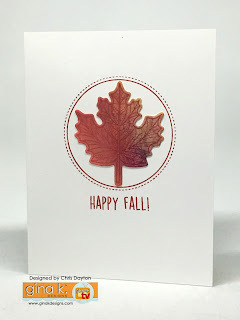 Awesome cards and loved the video and the tips on making your leaves. LOVE the maple leaf the best too, although they are all nice! Love your cards, especially the black one, that leaf is just beautiful on there, not to mention the blended strip! Thank for for the video. I loved it and can't wait to get my kit in the mail! Love your coloring on the leaves. Thanks. I am in love with your beautiful creation! I love the colors in your leaf, Chris. Fabulous products. Well done! They're all gorgeous. Love the distress oxides on the dark cardstock. Such beautiful leaves, nicely done! Your cards are all really lovely!! Gorgeous cards! And your video is great, too. I love seeing the process, thanks! What great ideas! Thank you for sharing and inspiring me! Great variety of fall cards with this set! I really like that maple leaf also! Thanks for the video using the DO inks. I love the blue DO on your charchol cardstock! The colors of those leaves are Gorgeous! I especially love the black background! Love the bright tie dye effects with the dark paper! Thank you for all the great ideas. Your cards are beautiful! Thank you for sharing the video of how you made them! Absolutely beautiful cards !! Those blended leaves are truly amazing. Oh Chris, these are all so beautiful. Thanks for the inspiration and the great video tutorial! Thanks for sharing your techniques. Your cards are lovely. Great cards made with this kit. Wow! Colors are simply amazing!!! Stunning cards!!! I'm saving your video, which was full of tips, to help me improve on these techniques, and what a wonderful stamp set to use for such diversity. Thank you for the loads of inspiration.